At Wave we’re running several Convox racks: production, staging, and multiple “dev” racks. Our production environment obviously needs to be running constantly, but the other environments are mainly used Monday to Friday, between 9am and 8pm. One of the reasons we’re migrating to AWS is the improved automation that it provides, and we are leveraging that to turn off our dev and staging racks when they’re not in use — saving roughly 66% on our EC2 bills for those environments. 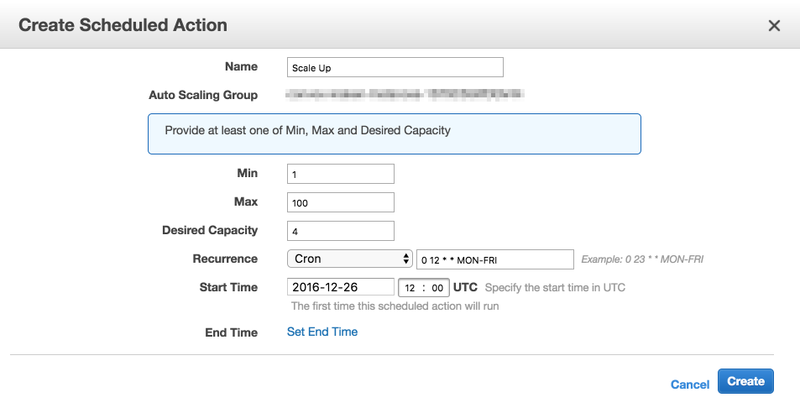 We played around with a few ways to achieve this, but the simplest ended up being AWS Auto Scaling Groups Scheduled Actions. You can set these up using the AWS console, CLI, or another tool like Terraform. Sometimes, a dev needs to do some work late in the evening, or on a weekend. We’ve created Jenkins jobs to allow our devs to turn the environment on/off as needed. We also added a second scale down time late at night in case the developer forgot to turn the rack back off. It usually takes between 5–10 minutes for a rack to spin up and start all of the app processes. We’re saving over $200/m by scaling our dev racks down during off hours. This will only grow as we increase instance sizes, counts and number of developer racks. Michael is an Operations Engineer at Wave. We provide invoicing, credit card payments, accounting, and payroll for small businesses. If you’re interested in joining the team, check out our careers page to find out why it’s a great place to work and get in touch!